I’m not in the same boat yet, but the planned expansion puts a nice bomb on the plans. Just purchased 4 enterprise plus to fit some new DL385 G7’s in the existing DL385 G5p/G6 clusters we have. Expanding the ram next year is just a no brainer if we upgrade ram, its extra licenses. might just aswell buy more hardware…. and there virtualization with VMware is now less attractive in the long run, as that was our solution to cheap’ VM’s instead of putting in new racks every 3 months, I just did some magic in VMware, like double ram, an extra server… No more… What is fun is that it appears VMware refuses to understand this approach to virtualization amongst their customers. vSphere 5 is all about mission critical, ignoring the less important load. So thats what we put into opensource virtualizations or hyper-v? Your mixing up cores with CPUs and physical ram with vRAM (in virtual machines) but essentially you are right. I will be looking hard at how this can be resolved and if Citrix Xen/MS HyperV is good enough in their next releases. Vmware will probably be too expensive with the current license model. For this new licensing scheme, you have to do the calculations on your *total* real world data center design, and not look at isolated servers. * What is the memory utilization of each server – not 100%. You license only vRAM, not pRAM. * Do you have other machines/clusters with lower utilization that can be added to the pool. I’m not a licensing specialist, but if you have questions let me know and I’ll grab one. oh, yeah. We are moving HA resource from is something we don’t use become to something we are illegal to use. Once your VM memory breaks up the ratio 4GB memory each VM, the cost of each VM we deploy will rock up through the roof comparing with vSphere 4 which is 0 cost. 4GB memory for a win2k8r2 is standard recommendation. And there is bigger chances we will use more memory in the near future since we all start to deploy Exchange, SQL, ERP into VMs. I’m pretty sure MS and Citrix are enjoying this moment and start to breath easily and regroup so they will give us something not much fancy but just handy and solid VM platform. I believe there will be one day Vmware realize they shoot themselves on the foot and change the license schema. At the end of day, it’s just license. Not technology obstacles. Hi John, one example where the numbers simply don’t work out in any reasonable way: We have many machines with 2TB of memory and the ability to put 4TB (these are 8-socket machines). vSphere 5 licensing includes 8 x 48GB = 384GB of vRAM entitlement and we would have 1,664GB remaining, requiring another 35 processor licenses. Let’s say we have 80% memory utilization, so 1,638GB total, we’re left with 1,254GB to license after excluding the 384GB included in the 8 processor licenses, so another 27 processor licenses. Even if we partition these machines into 2 x 4-socket systems with 1TB each, and include 1 partition for HA fail-over, we end up with $200k in cost for 2 of these systems, whereas previously it was $56k. So, still 3.6x as much. I know it’s been discussed quite a bit that lower memory per CPU is more efficient cost-wise with vSphere 5, but when someone standardizes on hardware based on the then-current licensing method and this >3x price increase comes about, it’s impossible to justify the value to upgrade and customers will simply want to run large workloads on bare-metal instead. They’ll get better performance anyways and be able to buy more hardware, CPUs, and memory with the money they saved by not having to use vSphere 5. 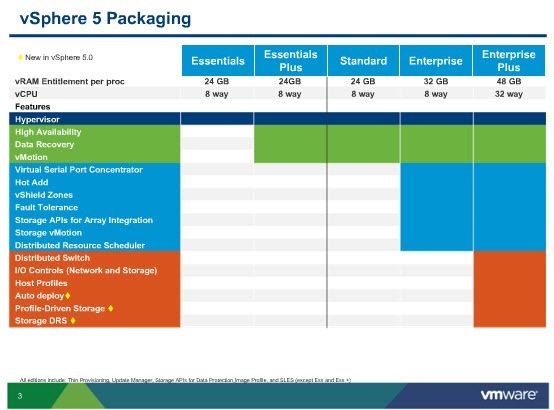 Yes it’s more convenient with vSphere to have dynamic allocations of resources, but for larger workloads, where vSphere 5 would shine, convenience isn’t worth the money. Finally VMware need to admit in virtualization memory and DISK performance is more important than CPU. Most of the time their so call sales and SE will insist not to go for high consolidation ratio in the past due to HA and performance consideration. Now with the new license model, they kind of agree that is limit them to make more money, therefore they cap for the vRAM rather than CPU. Oh No VMware, I would seriously do a u-turn on this licensing model. Don’t do a Novell, and give Microsoft and Citrix a hammer to hit you with!. Your customers will leave in droves if you do not. Why do this to make extra profit?. For some time now I have said, all VMware need to do is carry on producing excellent improvements like vSphere 5, SRM 5 and eventually integrate them into one product. You are miles ahead of the competetion in these technlogical areas. Keeping your customers on present profits is better than losing customers and experiencing profit loss, and giving MS a foothold too do a Novell on you. I’ve done my change 2 years ago and switched to CA/3Tera Applogic. They still use simple pricing per socket CPU regardless of core nor RAM and there is only 1 product to purchase. Nice and easy. Also support is included but you could be better off using MSPs (ther partners) for external support at side…. I went through the same scenario and I have finally decided to use Hyper-V, Xendesktop and Xenserver for the multi million centralization project. VMware has to fix license or they will be loosing clients. Citrix licensing was way cheaper and you get hypervisor for free on platinum edition. No hardware limitations. Good luck on that Rajes!. Even though VMware priced vSphere 5 too high, which it has now eased a little, I would never have gone the route you have chosen. Citrix is pretty lost with XEN, what is happening to XEN when KVM takes market share in this inux world. Hyper-V is just not scalable, so you will be needing to be lots more hardware and Windows licenses which kind of negates your cost savings. If you have a disaster with VMware, SRM and HA provides a robust recovery. Not the case with Citrix and MS!.